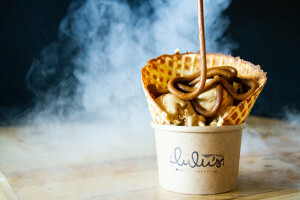 In an industry where it seems that innovation is only in taste, Lulu’s Ice Cream, a Miami based ice cream shop considered one of the 14 best ice cream shops in Florida, shows us that it is also possible to be innovative in the technique, making ice cream using fresh products and freezing them with liquid nitrogen. 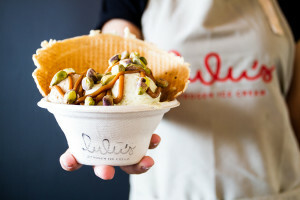 Here, Luisa Santos, founder of Lulu’s Ice Cream, discusses what makes her ice cream shop unique and which marketing strategies allowed her to boost her business. Luisa, you were recently named Young Entrepreneur of the Year by the SBA. Why do you think you got this award? In this process, I learned that this award has to do with the growth of the company and also what the company has given to the community. So much of what they took into account was everything we do in Miami with our team and opening our doors so that the community has a space to meet and also, as there have been two hurricanes, the programs we have done with other small businesses in the area to help as we can. 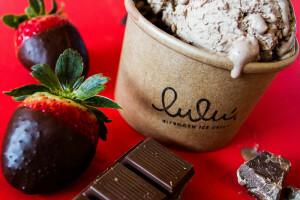 Lulu’s Ice Cream has been considered one of the 14 best ice cream shops in Florida by Florida Rentals. What makes your ice cream shop unique? There are many differences. I think the most important one is the ingredients we use and how they’re processed. So, we have adopted a cow called Lulu that lives in Dakin Dairy Farm, the farm where we buy all our milk and cream, which is the most important ingredient. We work with farms in Homestead and The Redlands, which are two areas that are about an hour, an hour and a half [from Miami] where many tropical fruits grow. So, we have agreements with people who have farms there for local fruit. The important thing is that we make the whole base in our store from the beginning. Everything is mixed here, no chemicals are added, nothing extra. 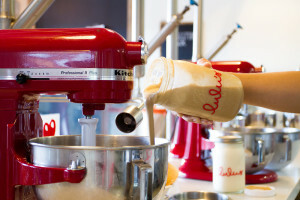 Everything is as simple and basic as possible, and [the ice cream] is also the freshest because the base is made every day and when people ask for an ice cream, it is frozen right here [in the store], next to them. 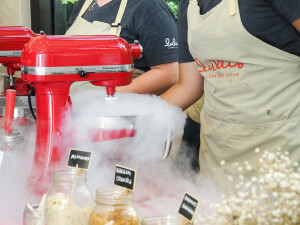 Therefore, the quality of the ingredients and the freshness are two very important distinguishing factors and also that we freeze our ice cream with liquid nitrogen. Each serving of ice cream freezes in 30 seconds and no air is added as in most ice creams which need to freeze for about nine or eight hours. Therefore, our ice cream is much more compact which makes it possible to eat like three balls of any other ice cream in one… then you have to be careful [laughs]. Do you have a direct competitor in Miami that uses that same technique? We have competitors who use this same way of freezing ice cream but they do not make their ice cream from the beginning. They are buying ice cream bases, which is very common in ice cream shops. Therefore, the base already has many of these chemicals like preservatives or stabilizers so they last a long time and they then add the flavor in the ice cream shop. So, there is no one who does exactly the same thing as us. In addition, our ice cream shop is a place where the environment is taken into account: The cups are biodegradable and the spoons are made of recycled wood. How did the idea of selling organic ice creams finish with nitrogen come about? We have seen that you have a strong brand image and that you have worked carefully on its design. How important is it for you to have a strong and homogeneous brand image and how have you built yours? I have been very lucky because my two best friends work in design, so at the beginning, they helped me a lot and taught me the importance of having a solid brand image. After learning it, we have been very strict in making everything uniform so people can know that this is Lulu’s before they know it’s Lulu’s just by looking at the colors, the logo… I think it’s important because it tells the story of our company without us having to tell it. Like anything you see in Lulu’s, like any ice cream, everything has a thought behind the decision that was made, both in the colors, the logo… and sometimes it changes and we launch new designs. Our menu board, for example, has changed a thousand times and continues to change depending on what we want to tell and how we want to tell our story. But it is very important because people start to recognize it. It also makes the company replicable. 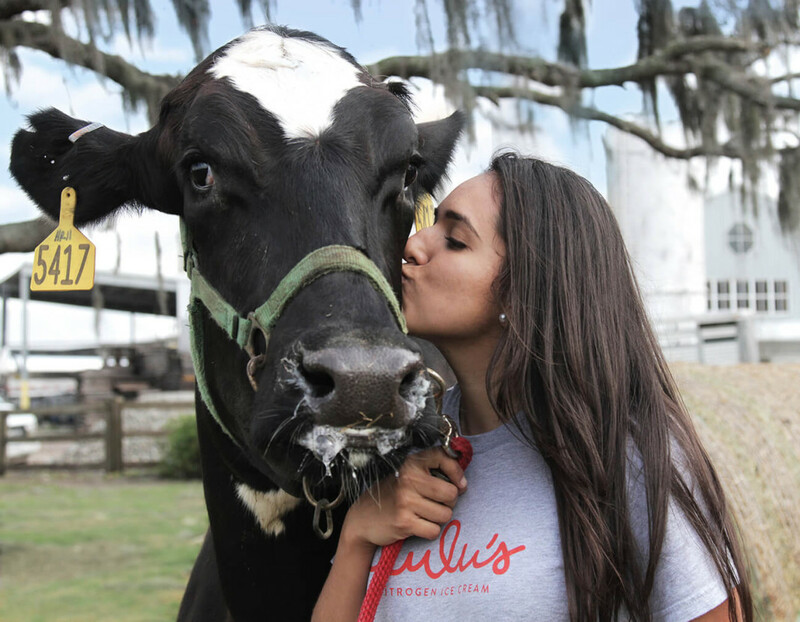 Many people who come to the store ask us, “how many Lulu’s are there in the world?” They immediately have the idea that there isn’t only one Lulu’s. What marketing channels do you use and which one directs the most customers to your business? Some are more difficult to measure than others, but we are on Facebook, Twitter, and Instagram when it comes to social media. Instagram is the channel that directs more customers to our business, currently. It’s where we have more followers because ice cream is obviously very visual, so that’s where we can best tell our story. Many people enter the store showing us their phone and saying, “I want this” and it’s an Instagram photo. We also use a loyalty program where people use their phone to accumulate points, which has been very successful because we also give away free ice cream for birthdays and many people love that. In fact, the articles and stories that we have organically received from other media have also helped us a lot. Then, Google, Yelp and Foursquare are very important for us because people who are geographically close to us find us there. And what about the reviews obtained through these platforms? Are they important for Lulu’s? Yes, absolutely. The brand is not what you want people to know about you, but what people say about your company. Then, the reviews are direct contact with our customers to understand what frustrates them, what they want to continue seeing. It’s a way to see if people are having the experience that we want to give them. What do you do when you receive a negative review? For us, it’s important to understand that it doesn’t matter what we believe. If that person had a bad experience, we believe that they had a bad experience and do everything we can reasonably do to improve that experience. We never try to fight with someone or tell them that something didn’t happen because if they wrote it, it probably happened. Internally, we try to understand why it happened and we communicate it to the whole team so that it doesn’t happen again. Actually, what we try to say when we respond to these reviews is that we take into account everything they tell us and that we want them to give us another chance and that we hope they will come back again to enjoy the experience we want to give them. We have already seen that Instagram is a key piece in your marketing strategy. How do you use this social network and what kind of content works best for you? We have realized that what works best for us is to show photos of our product, so, it’s our ice cream. Every time we try to put up another type of content, the engagement always decreases. People want to see the ice cream, they want to see the cute ice cream, then that’s what we show on this social platform. One of the strategies we use a lot is using the content that users create when they come to the store. Many people take very nice pictures, so we ask them for permission to put them on our profile and we mention them. This has helped us a lot because it’s difficult to have content to publish all the time. We are not going to have a photographer here every week, so we use a lot of what people publish. We’ve seen that you also show high-quality corporate videos on your digital channels. What role does the video play in your marketing strategy? For us, these videos have been important to gain credibility when we enter meetings with much larger clients. These videos demonstrate a certain level of professionalism and allow us to show the experience we offer. Then, they transmit confidence in our ability to execute at a professional level. How do you get your customers coming back? We have a points program where customers leave us their phone number and we send them text messages for free ice cream on their birthdays and other promotions. Although, I think the key is to offer a very good product and experience so they want to return. If we can offer this to every customer that comes, it’s like winning a customer for life, but it’s the hardest thing to do. It’s much more difficult than any points or discounts program. What advice would you give to a new startup? I always say start small in the cheapest way you can to start but “start.” There are many people that spend a lot of time thinking to make everything perfect. No. I always say “start small” because there are many people who, when they start, realize that this is not what they really want to do. It’s better to realize that it’s not what you want to do at the beginning before you have invested a lot of money or a lot of time. So, my advice is to start and always, always ask for help. Never be afraid to say that you don’t know how to do something or call people you don’t know to ask for help, it’s very important. As for marketing, my advice is to start with one channel and do it very well. Listen to your followers, understand what they want. Use it as a means of communication. Finally, we would like you to give us a little prediction. What do you think will be the best way to gain customers in your industry in the coming years? The best way has always been and will continue to be to offer an incredible experience. Digitally, we have the geographic limitation of people who are in a certain area or are going to visit Miami. So, for us, I think it will continue to be that people can find us on Yelp, on Google or on the platform that most people are using at that moment, that geographically places us as number one in the area.